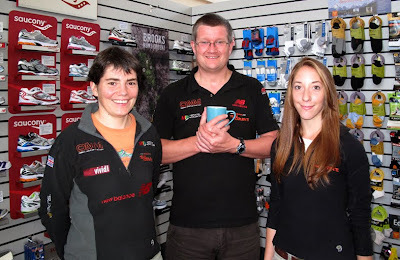 Debbie, Stuart and Edie are part of the Sheffield fell-running ‘tribe’, passionate about running up hills, down dales, along canals and up mountains. Over the course of the afternoon we spent at the shop, Stuart takes us through a range of subjects from store layout, business development, how they are bucking the economic downturn, marketing, ergonomics, shoe design, the scope of the running community, and the importance of the cup of tea. He also explained why he needs cover the city’s football divide, stocking shoes in red (for Blades fans) and blue (for Owls). The shop has been open a few months, sited in Attercliffe, an area close to the city centre, associated more with manufacturing and lap-dancing clubs than state-of-the-art sports shops. However, their building G9 is one of several ‘G for Gateway’ buildings owned by a local millionaire, who is investing in the area he grew up and hoping to kickstart an upward spiral. And as Stuart says, “the locals have been really welcoming and friendly”. Of course, Accelerate offers what any good running shop offers – an excellent range of kit and shoes, with the equipment, experience and knowledge required to analyse gait and get a good fit. However, this shop goes a few steps further. As customers enter, they are greeted with “hello, kettle’s on. Tea? Coffee?” Rather surprised customers wonder where the catch is but there’s no catch, just a warm sense of community formed by a shared love of running up hills in the pouring rain! They also let customers wear the shoes they’ve bought outside in the streets and will still change them if they’re not right. Stuart and Debbie lead regular ‘Breakfast’ runs for their customers, an hour or so out in the area followed by coffee and pastries. The shop sponsors two local pro fell- and road-runners.